Chorionic hematoma (also chorionic hemorrhage) is the pooling of blood (hematoma) between the chorion, a membrane surrounding the embryo, and the uterine wall. It occurs in about 3.1% of all pregnancies, it is the most common sonographic abnormality and the most common cause of first trimester bleeding. Subchorionic hematomas, the most common type, are between the chorion and endometrium. Retroplacental hematomas are entirely behind the placenta and not touching the gestational sac. Subamniotic or preplacental hematomas are contained within amnion and chorion. Rare. Most patients with a small subchorionic hematoma are asymptomatic. Symptoms include vaginal bleeding, abdominal pain, premature labor and threatened abortion. Ultrasonography is the preferred method of diagnosis. 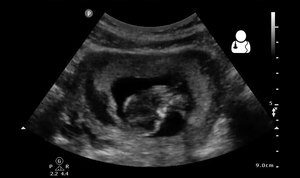 A chorionic hematoma appears on ultrasound as a hypoechoic crescent adjacent to the gestational sac. The hematoma is considered small if it is under 20% of the size of the sac and large if it is over 50%. ^ "UOTW #3 Answer - Ultrasound of the Week". Ultrasound of the Week. Retrieved 27 May 2017. ^ Avneesh Chhabra, MD et al. "Subchorionic Hemorrhage" , Medscape. ^ Trop, Isabelle and Levine, Deborah. Hemorrhage During Pregnancy: Sonography and MR Imaging . Amer J Roentgenology 2001; 176:607-615. ^ Trop I, Levine D. Hemorrhage during pregnancy: sonography and MR imaging. AJR Am J Roentgenol. Mar 2001;176(3):607-15. ^ Abu-Yousef MM, Bleicher JJ, Williamson RA, Weiner CP. Subchorionic hemorrhage: sonographic diagnosis and clinical significance. AJR Am J Roentgenol. Oct 1987;149(4):737-40. ^ N. Stamatopoulos; C. Lu; F. Infante; U. Menakaya; I. Casikar; S. Reid; M. Mongelli; G. Condous (2013). "OP03.03: Does the presence of subchorionic haematoma increase the risk of miscarriage?". Ultrasound in Obstetrics & Gynecology. 42 (s1): 54. doi:10.1002/uog.12736. ^ Maso, G.; Dʼottavio, G.; De Seta, F.; Sartore, A.; Piccoli, M.; Mandruzzato, G. (2005). "First-Trimester Intrauterine Hematoma and Outcome of Pregnancy". Obstetrics & Gynecology. 105 (2): 339–44. doi:10.1097/01.AOG.0000152000.71369.bd. PMID 15684162. This page was last edited on 14 March 2019, at 07:06 (UTC).